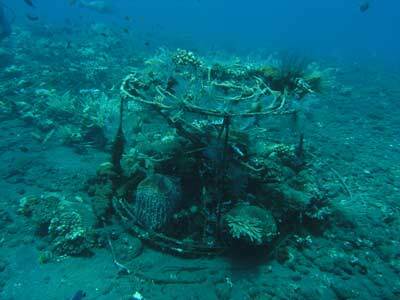 Coral Gardens is located probably 600 metres to the south-east of the wreck of the USAT Liberty. An approximate GPS mark for the dive spot is 8� 16' 37.8"S 115� 35' 38.1"E (using WGS84 as the datum). 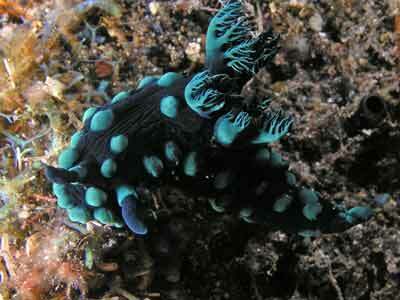 As with virtually all dive sites that you do here, you gear up at the dive shop and then walk to the actual site. Meanwhile, your dive gear is transported by porters (on their head or on a scooter). From the shop you walk to the right down the main highway, cross the road and take the first lane on your left. This leads to the water, but we are not going right down there just yet. About 80 metres along the lane there is an empty block on the right with a foot track going off through it. This is the same track that you take to get to The Drop Off. The track ends up coming out at the beach and there is also a small car track that comes in from the right (from the highway). Again, as at other sites, the beach is composed of larger rocks and care needs to be used when entering and exiting the water to make sure you do not twist an ankle. 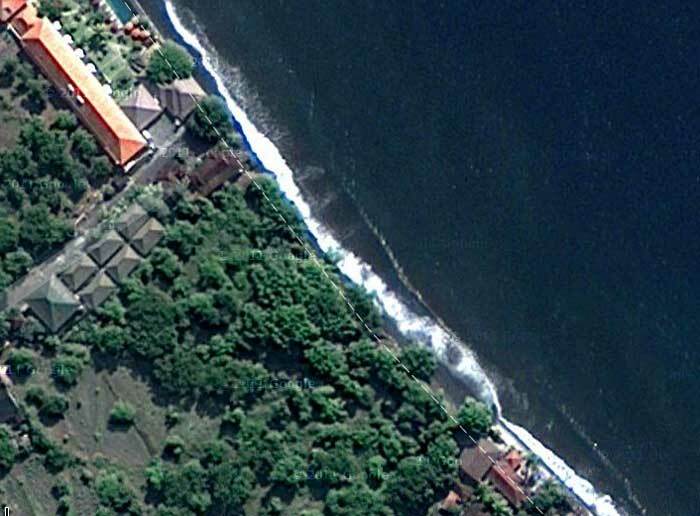 The sea floor is black sand and slopes gradually to over 30 metres. Like other spots, there are sand ridges that run perpendicularly to the shore with shallow gullies in between. We descended along the ridge straight in front to about 28 metres. 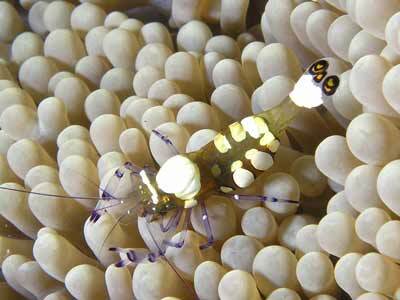 Here there was a fish cleaning station staffed once again by a couple of species of cleaner shrimp. 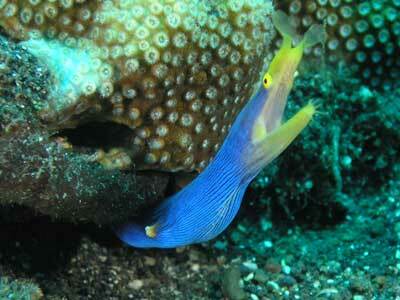 There were dozens of them here and a largish moray eel getting cleaned. I decided to see if they would clean my mouth and teeth so I moved closer to the shrimp, took out my regulator and opened my mouth. Sure enough, a couple jumped across to me and entered my mouth. One started crawling inside and presumably cleaning me. All I could feel was as if someone was using a toothpick to run over my face, lips and inside my mouth. When I needed to breathe, I just blow out and they returned to the rock. Amazing! From here were zig-zagged back up the ridge and saw lots more things. 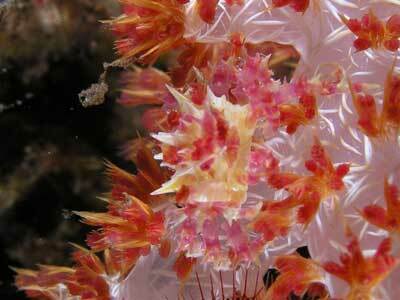 There were spindle cowries on sea whips, featherstars with interesting crabs and many species of nudibranchs. There were also more crabs and shrimps, a small octopus and a large cuttlefish. After 45 minutes we ended up back near the shore. In this area there are a couple of artificial reefs. One is a drum shaped structure built from reinforcing iron. The other is built in the shape of a single engine airplane. The idea is that broken bits of coral are attached (using twine or cable ties). 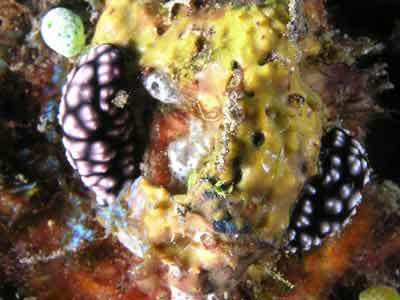 This ends up growing in size and attaching itself to the iron and then eventually other pieces of coral. While the iron will end up rusting away, by this time the coral should be so well established that it becomes self-supporting. 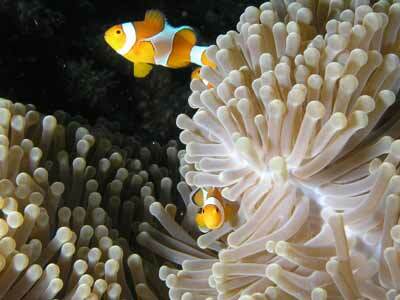 There is a large amount of coral and other creatures now attached to these structures. The airplane�s �wings� have collapsed and the tips are resting on the sand. 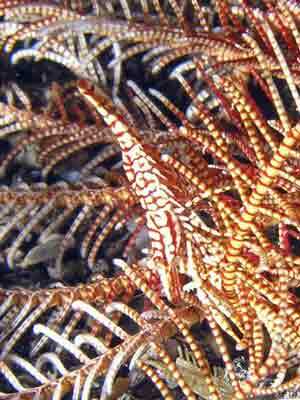 There are lots of things living in these reefs, including many firefish. 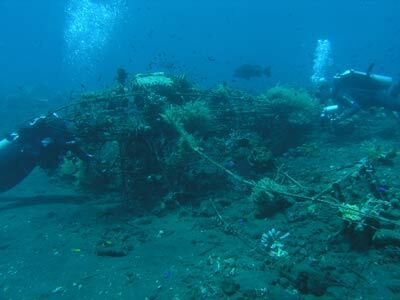 This is a very good dive site, well worth doing if you are here. 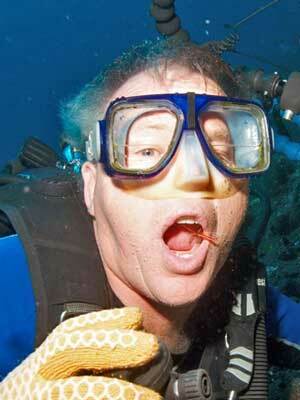 The visibility was probably 30 metres and the water temperature was about 27�C. Click here to return to see the dive profile from my computer.